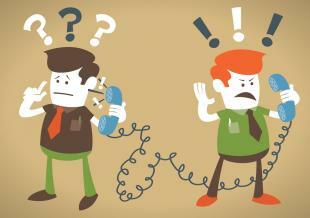 If you work in sales or customer service, you’re probably no stranger to the occasional and classic angry caller. While unpleasant and sometimes unreasonable, navigating a hostile conversation to calmer waters can be difficult. However, in the world of business it can take years to build a relationship with a client or customer and only minutes to destroy it. Studies have shown that people who encounter negative experiences will tell an average of 16 people about the situation. Although receiving negative feedback from a caller can be unpleasant, it’s important to also recognize that this is an opportunity for you to learn more about the situation. Unlike dissatisfied customers or clients who do not take the initiative to let you know what problems they’re having, when talking to an angry caller you have the chance to understand what went wrong. Remember to ask for the information. The angry caller may direct the conversation in a specific way but it’s your responsibility to pick, choose, and ask for applicable information to help. Many disputes and problems arise from lack of information and when talking to an angry caller, sometimes asking for more information can also help the caller better rationalize and process the situation. There will be times when callers will want to vent about inconveniences and distastes for certain things. While saying “I understand your situation” may not always hit home with everyone, verbally acknowledging that you are hearing the complaint can be helpful. Repeating and mirroring the facts back to the caller can communicate to the caller that you empathize with the situation and that you are making an effort to understand what’s going on. Even when you’re not on the receiving end of an angry call, it’s nice to have options. Sometimes there will not be an immediate solution to resolve the caller’s situation. However, providing clear timeframes and multiple options to move forward can direct the conversation away from complaining. Also, it can empower the angry caller to take ownership over his or her situation and to make a new decision. Oftentimes, frustrating situations make callers feel powerless and being able to provide the caller with a sense of control can help calm even the angriest of callers. As mentioned before, keeping your callers happy makes your business better. So the next time you receive a message from an irate caller, remember these 3 simple steps and improvise as necessary. Callers may start out angry, but they don’t have to stay that way!